According to a new research paper published in 'Science Advances', 9.1 billion metric tons of plastic have been produced since 1950. That represents one ton of plastic for every living person on the planet, with nearly 7 billion of these tons no longer in use. 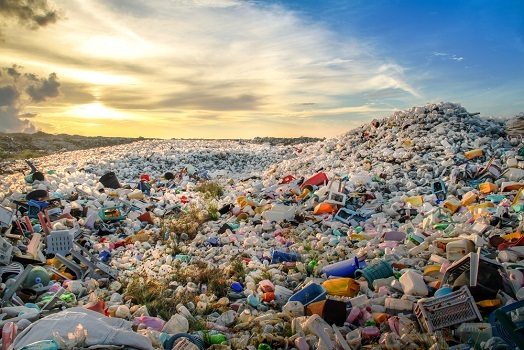 While 9% of plastic is recycled and 12% is incinerated, that still leaves 5.5 billion tons of plastic to waste away on the land and in the water. “At the current rate, we are really heading toward a plastic planet. It is something we need to pay attention to.” says Roland Geyer, lead author of the study and industrial ecologist at the University of California. The use of plastics boomed after World War II and has been growing ever since. Plastic production has outgrown all other man-made materials other than steel and cement, which exist for longer in buildings and cars and degrade much better than plastic. Roughly 35% of all plastics are made for packaging according to the study, including those woven into fibres such as polyester and microfibre materials. If you weighed all the plastics that have been produced over the last 67 years, they would be as heavy as 25,000 empire state buildings, 80 million blue whales, or 1 billion elephants. Our use of plastic continues to accelerate at an astonishing pace, with half of all plastics produced in the last 13 years and 34 billion tons projected by 2050. “The growth is astonishing and it doesn’t look like it’s slowing down soon." said Geyer, with the world creating 448 million tons of plastic in 2015 alone - more than double the number produced in 1998. China produces the most plastic, followed by Europe and North America, with much of the stuff finding its way into our oceans. You can't even escape plastic on a remote island, with Henderson Island in the South Pacific covered by 18 tons of plastic – the highest density of anthropogenic debris recorded anywhere in the world.